Hollywood, La La Land: where the sun is always shining and dreams of becoming a star come to life. I’ve lived in California 12 years, but have only been to the LA area 3 times in my life. I had never made it to Hollywood. 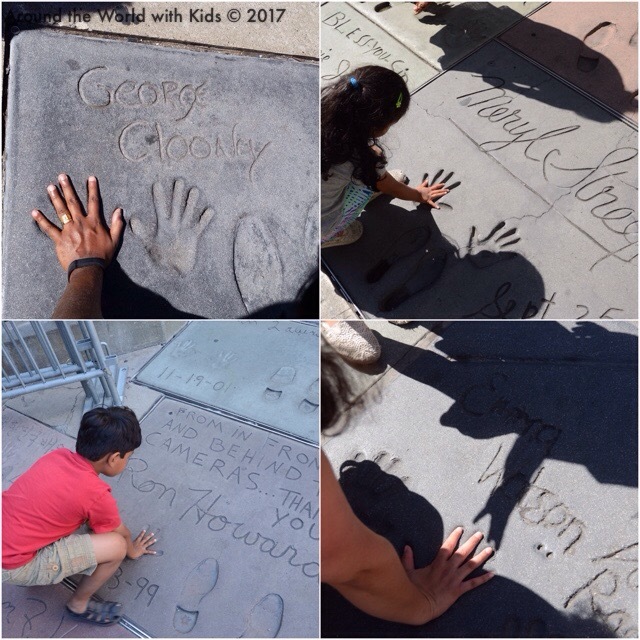 When we decided to head to Los Angeles for Memorial Day weekend, I knew I wanted to tick someone off my bucket list, putting my hands in the handprints of some of my favorite stars. 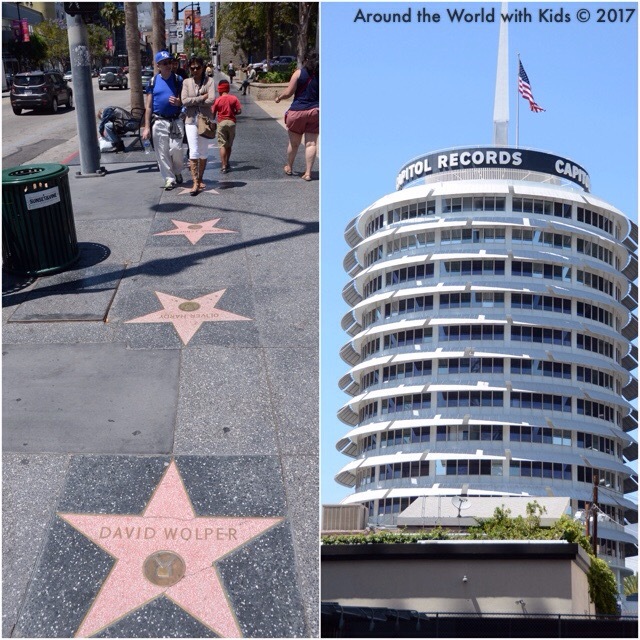 After a morning in Griffith Park, we headed down to Sunset Boulevard and Vine Street, the start of the famous Hollywood Walk of Fame. Started in 1958, this was an attempt of the volunteer president of the Hollywood Chamber of Commerce, E.M. Stuart, to start a tourist attraction that would bring life back to the dying city. 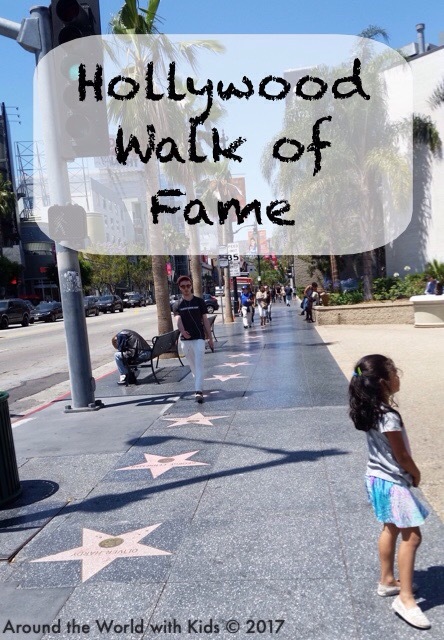 Starting with 1,558 stars, they picked the best of film, television, and radio to honor with starts and their names on the sidewalks of Hollywood. Today there are more than 2,600 stars and the walk stretches about 2 miles. We walked up Vine St. to Hollywood Blvd, then turned left, and walked the mile toward the Grauman’s Chinese Theater. 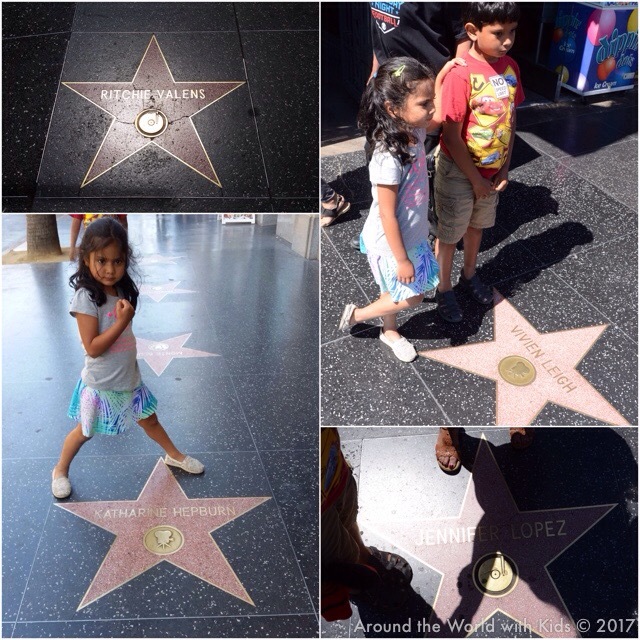 Along the walk we could hardly keep our eyes forward as we looked down and recognized so many of the names of stars we admired from today and the past. We tried to explain what some of these name meant to us to the children, but that quickly became overwhelming for both groups. So it became a game to the children, seeing how many were from movies, TV, radio, etc. Finally, we knew we were getting close to the theater when the crowds started to get thick. Then suddenly, it was there! In front of us were throngs of people, and scores of hand and food prints all over the ground. We immediately set to work looking for the ones we wanted. Ron Howard, Meryl Streep, Marilyn Monroe, Robin Williams, I could go on. Here it was the kids really enjoyed seeing how small or big their hands and feet were compared to the stars on the ground. Though, they were upset when they found out they didn’t get to do there own and hand and foot prints unless they were famous. We all found our spirit celebrity. Meryl Streep is a particularly good fit for my daughter. 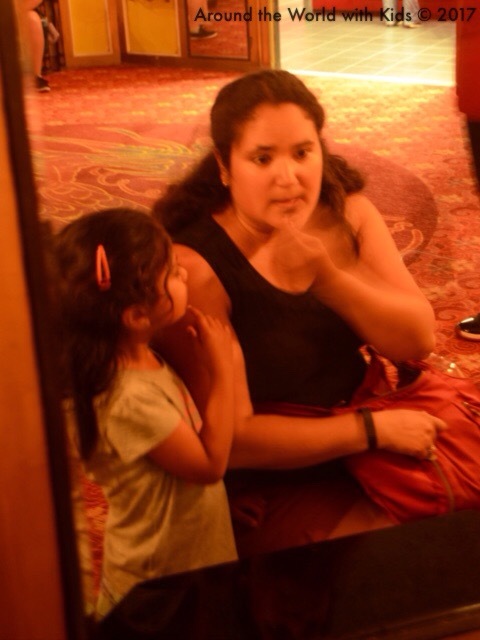 We found out that there was a tour of the theater, and it was quite reasonably priced so we decided to check it out. We were not disappointed. The tour took us in the theater and gave us the history of the theater. 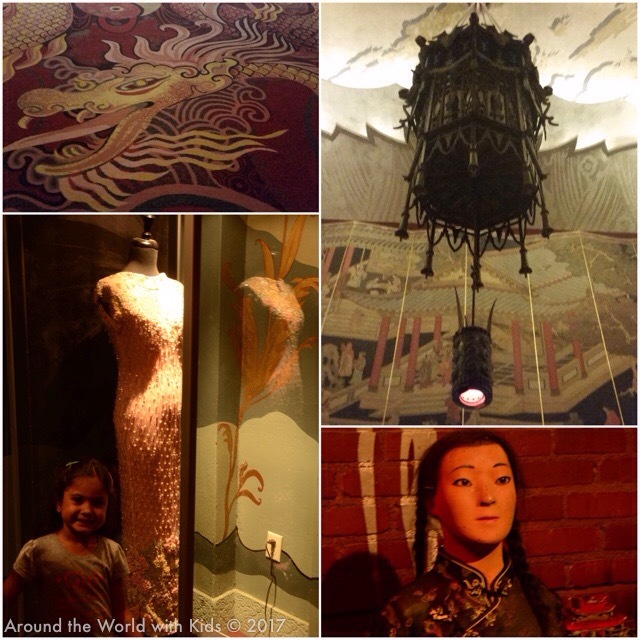 Why the Chinese decor, how Sid Grauman got the pieces and brought them over, a detailed explanation about each historical piece in the lobby (Dorothy’s dress from Wizard of Oz, the stone tablets from the 10 commandments, and all the Star Wars memorabilia that was left when Carrie Fischer passed away.). The tour later took us downstairs to the powder room, where we heard about the secret tunnel that was once used to bring in famous stars, and the area where stars would redo their makeup and touch up before going in. I, completely by accident, ended up sitting at the vanity that was Marilyn Monroe’s favorite. I couldn’t resist sitting in it, and touching up my own make-up. After the tour, he took us out and pointed out some of the more interesting squares. 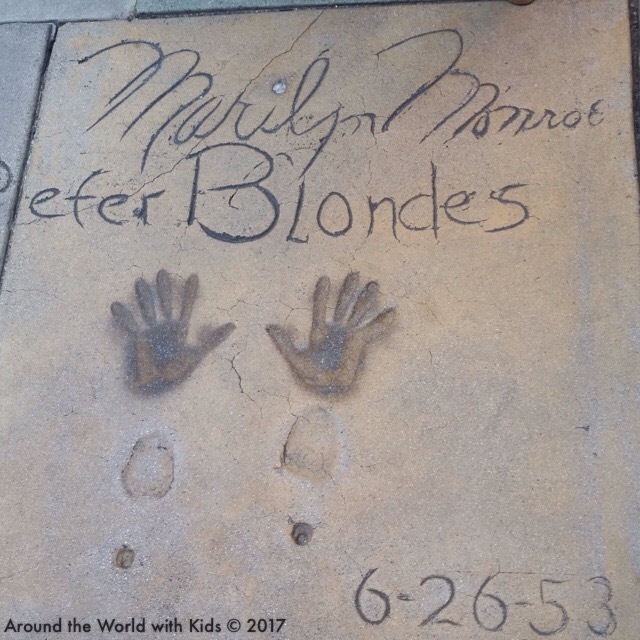 Marilyn Monroe’s is apparently, the most visited, such that the hands are permanently darkened from the oils on people’s hands. Rita Hayworth wanted the smallest footprints, so she squeezed her feet into children’s shoes for the ceremony and had to be cut out of them. And Whoopi Goldberg’s has an imprint of her dreads! Afterward, we went into the attached mall, where we hit up Waffle Jack for a sweet treat as a reward for our walking. 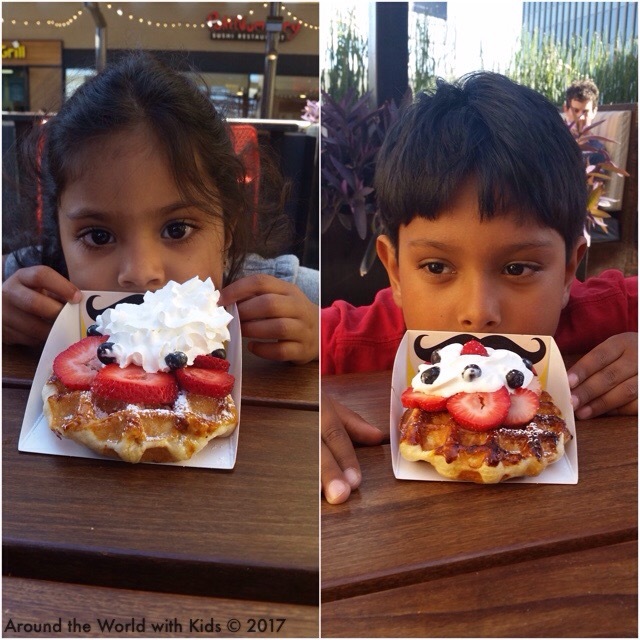 The kids got waffles with berries and fresh cream, my husband one with Nutella, but I went all out with ice cream AND Nutella. It was worth every single calorie. Then, we had to get back to our car so we attempted to burn all those calories on the long walk back. We walked the opposite side of the street so we could see new names, but I admit we were all kind of tired of and overwhelmed by the sheer volume of talent honored, that it was hard to have the same level of enthusiasm on the way back. Climbing in the car my hips hurt, my legs hurt, and my Fitbit was telling me I was an overachiever at 15K steps that day. But I was thrilled to have spent a day honoring all those talents I see up on the silver screen. I got my wish. And I was contented in the knowledge that my hands and feet are the same size as Emma Watson.